and its now my number 1 favorite knife in my collection. I got this knife from GPknives a while back and have been putting it throughout its paces. it is a bit bulky for the pocket, but is doable. The standard bench made BK-1 coating shows wear (i wish it was DLC). 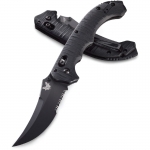 the only grip i have is that the pocket clip is a joke I snapped mine the first time it got snagged. 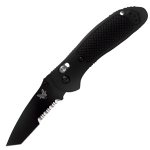 Benchmade did send me a new one right away for no charge, but Thy should have put a better clip on such a large heavy knife. this one is abit tricky to judge..
-Build- Overall this knife is built very well. 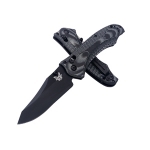 It is very sturdy (coming from the full metal supports all the way down the knife and the D2 steel itself being a more ridged steel) It is not a light knife, if you want something light agile and doesn't feel like a battle axe this isn't for you. The knife itself is built to take a beating; prying, cutting, you name it. It can handle a lot of abuse. the plastic pieces on the handle are not cheap or flimsy as seen with many knifes but of a high quality resulting in a very good feel. -Comfort- The handle isn't what you would call ergonomic. It does fit very well in the hand though and sits very well when held. The jumping toward the blade on the top of the handle provides very good traction for your thumb when cutting. It isn't over done or excessive. -Quality- This knife is probably of the highest quality that I have ever known. 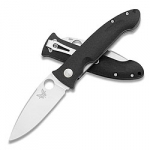 The D2 steel is very sturdy and able to retain an edge. Another aspect of this is that putting an edge back on the knife is very easy and can be done without expensive equipment. I was able to fine tune my edge with just a fine stone. Overall- I would say that hands down this is an excellent knife. It is very weighty though, don't say that I didn't warn you. All my friends joke that this is a tank killer. Easy to carry, conceal and use daily. 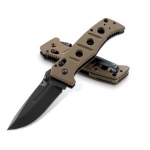 I would recommend this knife to anyone whether you are going for everyday carry or duty use.